Any polygon can be represented as a set of triangles, and any shape can be approximated by a polygon, so the triangular-mesh support has many potential uses. This diagram uses "pixels" and colors (grayscale), but for datashader the raster is more precisely interpreted as a 2D array with bins, not pixels, because the values involved are numeric rather than colors. 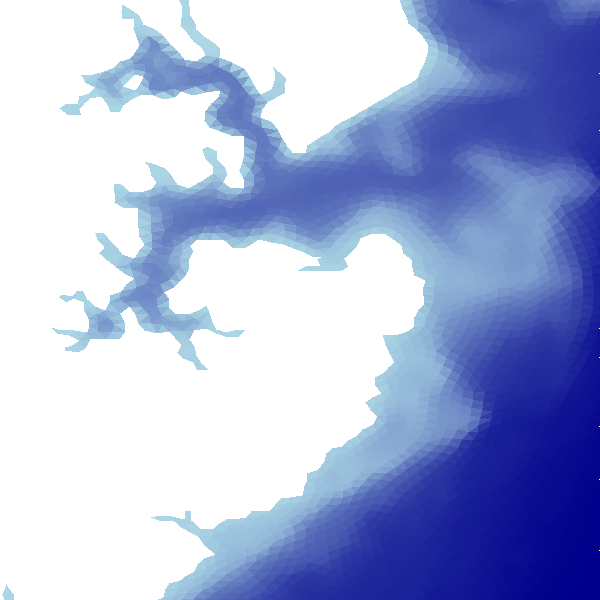 (With datashader, colors are assigned only in the later "shading" stage, not during rasterization itself.) As shown in the diagram, a pixel (bin) is treated as belonging to a given triangle if its center falls either inside that triangle or along its top or left edge. Triangles should be specified consistently either in clockwise or in counterclockwise order of vertices (winding). Like the rest of Datashader, trimesh rasterization does not (yet) use the GPU; it's fast because of Numba compiling Python into SIMD machine code instructions. Generate a triangular mesh for the given x,y,z vertices, using Delaunay triangulation. For large n, typically results in about double the number of triangles as vertices. Given 10 vertices, created 12 triangles. Given 160000 vertices, created 319914 triangles. This mesh can be used for all future plots as long as we don't change the number or ordering of vertices or triangles, which saves time for much larger grids.